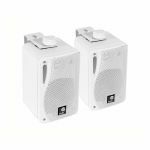 Notes: This pair of 3" 3-Way Mini Speakers are ideal for use in many commercial and domestic installations including multi-room systems; they are particularly recommended for PA use. The Speakers are moisture-resistant, which makes them suitable for use in kitchens, bathrooms or sheltered smoking areas. The durable ABS cabinet houses a 3" rubber surround woofer, a wide dispersion cone mid-range and a 1" super dome tweeter for powerful sound at all volume levels. Part of the e-audio Everyday Audio range, the 3-Way Mini Speakers are easy to fit and are supplied with a mounting bracket for convenience. Priced and sold in pairs. 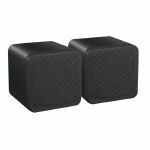 Notes: A pair of high quality, 10cm dual cone mini speakers. Ideal for use in the ceiling. These 80W speakers boast a robust ABS construction and have quick-connect terminals. Sold in pairs. The flagship of Tannoy's Eclipse range, the Eclipse Three is a loudspeaker designed to deliver the biggest scale performance and incredible value for money. The near 1metre tall ported cabinet is over 26 litres in volume and packs in the latest Eclipse 28 mm soft dome HF driver and twin 127 mm (5.00") Eclipse mid/bass drivers for truly class leading bass dynamics. Suitable for medium and larger sized rooms, the Eclipse Three is a substantial system upgrade for budget and more upmarket Hi-Fi systems as well as premium amplified network streamers. The Eclipse Three employs a D'Appolito driver configuration, usually only found on much more affluent loudspeaker designs. By placing the tweeter centrally between the two bass/mid drivers, the speaker's dispersion characteristics are smoothed through the critical crossover region. 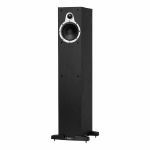 The result is a highly articulate musical performance on or off the loudspeaker's main axis, eliminating the room's traditional 'sweet spot' and delivering peak performance across more seats in your listening room. Backing up the class-leading sound-staging with real world dynamic scale, the Eclipse Three is tremendously efficient at 90 dB / Watt and boasts 240 Watt peak power handling. The larger cabinet and twin mid/bass driver configuration deliver outstanding low frequency response, with bass reproduction down to an earth-shaking 38 Hz... lower than many manufacturer's budget subwoofers! The Eclipse Three's braced cabinet, two-part plinth for additional stability and audiophile components add to up to a truly class leading loudspeaker design finished with equally premium touches. From the robust gold-plated speaker terminals to the 8-bolt driver mounting, subtle trim detailing and satin black oak finish, The Eclipse Three sets new standards for budget loudspeakers in both performance and looks. Tannoy's proven heavyweight fibreboard cabinet design is employed in the Eclipse series. Internally braced to minimise cabinet colouration, they can deliver tighter, more tuneful bass. The cabinets are also rear ported to assist deep bass reproduction and keep the front baffle's clean lines. The 5" Eclipse mid/bass driver offers unrivalled mid-band clarity and low frequency performance in its class. The cone is crafted from a light, stiff multi-fibre enriched paper pulp, coated to improved detailing and offering exceptional transient response to give rhythmic music realistic drive and punch. Eclipse crossovers include laminated core inductors for exceptional musical detailing. Tannoy's unique differential materials technology compound is used to damp micro vibrations on the polypropylene capacitors, further enhancing Eclipse's musicality and communication. The Eclipse range is finished to exceptional standards throughout. Finished in dark yet cool satin black oak and equipped with robust gold-plated speaker terminals, Eclipse leaves other budget loudspeakers in the shade. A dedicated plinth is provided on floor-standing models providing stability and ensuring fast and taut low frequency performance. This is further enhanced with adjustable floor spikes for precise levelling of the speaker cabinet without damage to carpets. Notes: The Tannoy Eclipse Two speakers offer the same unbeatable driver combination as the Eclipse one but in a larger, floorstanding cabinet - providing extra punch and deep bass performance. Suitable for small to medium sized rooms, the Eclipse Two is capable of outstanding musical communication across a wide range of music styles. Ideal for upgrading a budget audiophile system or for use with amplified network streamers, the Eclipse Two delivers a big sound from a relatively compact cabinet. The Eclipse Two boasts an 18.9 litre cabinet, constructed from heavyweight fibreboard and braced to reduce cabinet colouration. Fitted with the new Eclipse 1.1" HF driver and a single Eclipse 5" mid/bass driver, the larger ported cabinet allows the drivers to best engage with the room for an altogether larger and more fulfilling sound. With power handling up to 200 Watt peak, high 88 dB/watt efficiency and frequency response from 44 Hz to over 32 kHz, the Eclipse Two is capable of creating fine music irrespective of genre or recording format. With its two-part plinth for additional stability, robust gold-plated speaker terminals and close tolerance components throughout, the Eclipse Two redefines the performance standard for entry-level floorstanding loudspeakers. With its satin black oak finish, subtle trim detailing and removable grilles, the Eclipse Two looks as good as it sounds. The 5" Eclipse mid/bass driver offerS unrivalled midband clarity and low frequency performance in its class. The cone is crafted from a light, stiff multi-fibre enriched paper pulp, coated to improved detailing and offering exceptional transient response to give rhythmic music realistic drive and punch. A dedicated plinth is provided on floorstanding models providing stability and ensuring fast and taut low frequency performance. This is further enhanced with adjustable floor spikes for precise levelling of the speaker cabinet without damage to carpets. Notes: The Tannoy Mercury series has been satisfying the audio demands of hi-fi and home theatre enthusiasts for nearly two decades. Over the years, Mercury has consistently received international praise for exceptional performance combined with outstanding value for money. Following in the multi-award-winning footsteps of its predecessors, the new Mercury 7 series offers, yet again, improved performance, enhanced styling and a wider choice of finishes to coordinate with a broad range of interior decor. Delivering unrivalled power and musical entertainment, this new Mercury flagship is bigger, more powerful and more dynamic than ever. Suitable for larger listening rooms or where high volumes are required, Mercury 7.4's 44 litre twin-ported cabinet, dual 178 mm (7 inch) mid/bass drivers and refined 28 mm (1.1 inch) soft dome tweeter pack a mighty punch. To further enhance imaging and produce the widest soundstage, the drivers are positioned in a D'Appolito driver configuration. By placing the tweeter centrally between the two bass/mid drivers, the speaker's dispersion characteristics are smoothed through the critical crossover region resulting in a highly articulate musical performance on or off the loudspeaker's main axis. 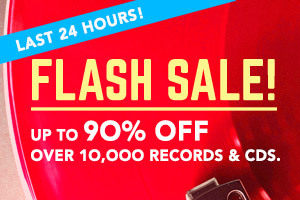 This eliminates the traditional 'sweet spot' to deliver peak performance across more seats in your listening room. As befits a flagship of any TANNOY loudspeaker series, the Mercury 7.4 boasts class leading peak power handling at 300 Watts and extremely high 93 dB/Watt efficiency making it suitable for the broadest range of partnering equipment.